This submersible white LED light is super bright and really easy to use. 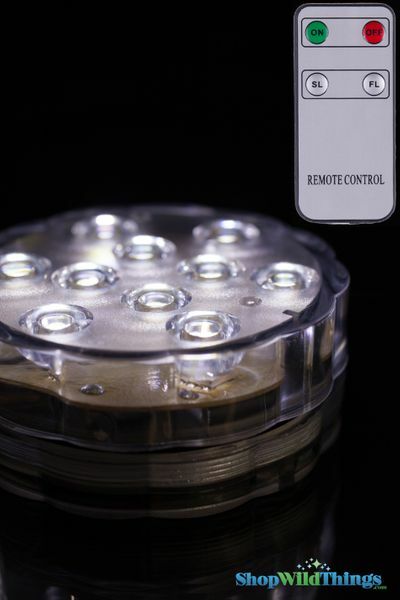 Controlled with a remote which is included, these 10 LED lights shine in a steady cool white, slow fade on and off or fast flash. This light is perfect for placing inside of vases or bowls as they are waterproof. 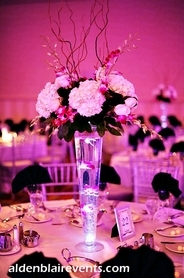 They can also be placed underneath of your vases to uplight your centerpiece designs! This light is 2.5" in diameter by 1" tall. Requires 3 AA batteries (not included). Put these lights in a crystal beaded candle holder. Just beautiful!